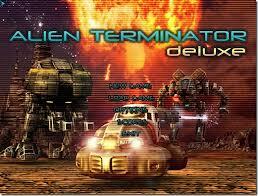 Alien Terminator Deluxe Our planet Earth was attacked by aggressive aliens. Invasion had been so sudden that human casualties were just uncalculatable. Aliens had perfect technologies and humans were always defeated in direct encounters. Due to interception of alien transmissions earth scientists were able to determine alien bases displacement. They were placed on the planets of solar system. The first level is a tutorial level where you learn to maneuver your vehicle (using the keyboard cursor keys) to move around a maze like structure. The controls are a little twitchy; making it quite hard to control the turning of your vehicles, but it does get easier with a little practice. This is important as in later levels you have to maneuver around lots of objects. You’ll also be given the opportunity to try out the various weapons that you carry on your vehicle. The top mounted weapon is controlled by the movement of the mouse; the mouse pointer becomes the firing reticule and the fire button is the left mouse button; grenades can be thrown by using the right mouse button and the super weapon by using the space bar. All key bindings can be changed to keys more comfortable to theindividual by going into the options menu via the main menu. Your main weapon can be changed from the default mini gun to a laser and pulse cannon using the mouse scroll wheel. It appears that all the weapons are upgradeable apart from the grenades, but I wasn’t able to confirm this as I only played as far as level 4 (the Jupiter level). You’ll find each level has a boss stage at the end of the level.